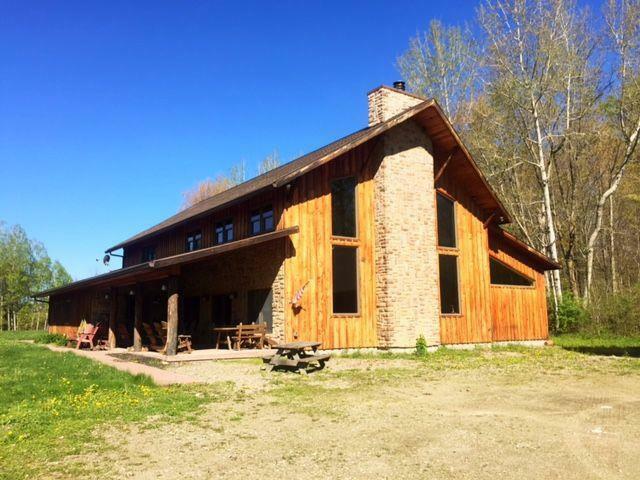 Contemporary, lodge style building situated on 86 acres along the snowmobile trail with 4 RV hookups, close to the Village of Bemus Point and Chautauqua Lake and Chautauqua Institution. Lower level has a great room complete with vaulted ceiling, large, wood burning fireplace, 17' wet bar with refrigeration, step down to a family-type room, open, kitchen with commercial Wolf, gas range, commercial Fridgedaire refrigerator, dishwasher and double sink, four bedrooms, 2 bathrooms, walk-in pantry, laundry room with stackable washer and dryer. The upper level has an open loft for added relaxing space, plus, two bedrooms and bathroom, with doors to exterior balcony. The multiple bedrooms and bathroom facilities will accommodate many for sleepovers or entertaining events. Added bonus of a 24' X 40' detached, 3-bay pole barn with back lean-to! Must see to appreciate! !